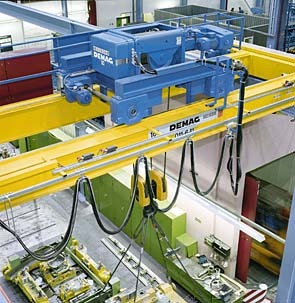 Terex Material Handling announced an order for two Demag DH Hoists (30-ton and 15-ton) with DFW Endtrucks from Hi-Tech Mold & Eng., Inc.
“Mt. Clemens Crane has supported Hi-Tech Mold’s new crane and field service needs since 1988,” said Charles Albright, President of Mt. Clemens Crane & Service Co., Inc. “We are pleased Hi-Tech Mold has ordered another crane for their tool building operations. We continue to supply proven Demag DH hoists, drives, and travel wheel assemblies for this demanding application. The customer benefits from smooth operating cranes with high reliability and safety features”.